Although the commercial real estate industry has slowly adopted full-scale energy technologies, evolving energy regulations and standards are prompting real estate owners and operating teams to better understand and report on asset energy performance. Historically, many business leaders viewed energy management as a low-level priority and opportunity that offered insignificant cost savings to their bottom line. According to a report from PricewaterhouseCoopers and EnerNOC, the world’s leading provider of energy intelligence software, total energy spend is a top-five corporate expense category. Now more than ever, companies are seeing how their approach to energy directly impacts their cost structure, risk profile, resilience, and brand value. Whereas before energy data translated to the numbers on a utility bill, new technology helps companies create informed energy management strategies that can deliver bottom-line results. In order to maximize impact and return on investment (ROI), real estate owners and operators must optimize existing energy management processes, a step that is often overlooked, but necessary to then plan for technology integrations and mitigate risks to energy performance. Energy management is defined as the organized planning and implementation of an energy conservation strategy. 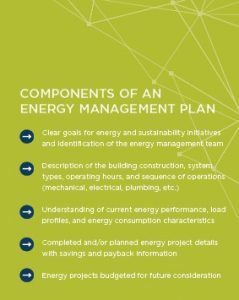 To develop an effective energy management strategy, real estate owners and operators must first understand and optimize a building’s existing infrastructure and energy performance, such as where and how energy is consumed and the financial impacts to the property and operating expenses. Oftentimes, energy reduction initiatives are started without adequate knowledge of key building systems and controls or current energy performance. A building’s electrical, lighting, and HVAC systems all consume energy; therefore, a clear understanding of these current system conditions is integral to any energy management strategy. The basics of optimizing start-and-stop times of an HVAC system and minimizing run-times can save hundreds of operating hours per year, leading to significant savings. Balancing the effective conditioning of occupied spaces without over-cooling and initiating simultaneous heating and cooling conserves energy. Property teams must also understand a building’s sequence of operations, including occupant HVAC system adjustability and system set points. The sequence of operations and operating protocols should be reviewed often as the building loads and use change. An important infrastructure detail to analyze is the level of automation. What is automated? How is it automated? Is more automation required? Careful consideration must be given to selecting and implementing an energy management system (EMS) that is engineered to control and optimize various system components to produce overall system efficiencies. Training those who will operate these systems and technologies and collect the data is paramount to achieving optimal system performance. Automation system vendor contracts often include on-site training or training at vendor facilities in the form of webinars, sit-down classes, or actual site-specific building automation system training. Regular audits of operating strategies and establishing energy management best practices help real estate owners and operators make informed decisions when investing in smart building technology. Cushman & Wakefield’s Energy Optimization Program focuses on low/no-cost energy conservation measures that can be implemented immediately to improve energy performance, including sound maintenance practices. A key step in performing an energy audit is to gather and analyze a building’s energy performance data, which includes examining past utility bills, energy usage trends, and load profiles. In addition, all building equipment must be inspected to ensure it meets commissioning and maintenance standards to help correct operational deficiencies. After analyzing a building’s energy usage and existing equipment, property teams can provide ownership with a summary of recommended energy conservation measures. Cushman & Wakefield recently completed an Energy Optimization Assessment for a client that achieved 11% in cost savings, equating to $38,000 in just six months. Once a building is built and begins to consume resources, building systems naturally experience deficiencies over time in performance and efficiency. Preventive maintenance helps minimize rising maintenance costs, energy consumption increases, and a decline in occupant comfort due to failures in building systems or deteriorating equipment. Building operations and maintenance should always include some level of retro-commissioning and calibration along with continuous review of the operating sequences. Monitoring based commissioning (MBCx), defined as collecting, storing, analyzing, and reporting on operational data to optimize energy performance and efficiency, should be part of a continuous building improvement plan. MBCx combines ongoing energy system monitoring with retro-commissioning (RCx) practices to provide substantial energy savings and improve building performance and compliance. The adoption of new technology to improve operations and reduce energy costs can be an exciting venture. But bypassing the basics of energy management can cause complications in the long-term reliability and efficiency of the building systems. A review of the current energy performance, design intent, sequence of operations, and controllability of existing systems is necessary to determine the next steps for integrating energy technologies. Click to view the full energy management article and a one-pager on Cushman & Wakefield’s Asset Services engineering platform. 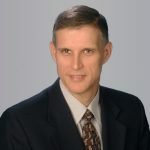 Mike Turzanski serves as the West Region Engineering Operations lead for Cushman & Wakefield. He is responsible for management and engineering support for the Western Region and brings 30 years of practical and technical experience related to the operation and maintenance of high-rise office buildings, retail facilities, data centers and steam plants. Lee Dunfee serves as the East Region Engineering Operations lead for Cushman & Wakeifeld. He is responsible for engineering operations in Cushman & Wakefield’s Eastern Region and works closely with city leaders, property managers, and chief engineers to deliver best-in-class operations for our owners and tenants. 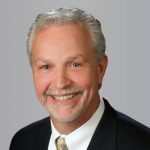 Mr. Dunfee also works closely with Cushman & Wakefield’s corporate engineering services group on new processes, procedures and corporate initiatives, including an internal energy management program.